Q: Do you prefer bags rather than plastic tubes to build? A: Both bags and tubes work, and each has its advantages. Bags are often easier to come by and can be cheaper. They are easier to fill and place, especially when there are only one or two people working. The tubes make somewhat smoother walls that might be a bit stronger, since the continuous fabric holds everything together in a more monolithic fashion. Q: I am considering building a small earthbag dome with tubular bags. The fact is that here in Italy, the only tubular material I can find is polyethylene, not polypropylene. Have you any experience with polyethylene? What could the difference be? Strength--can withstand considerable pressure without stretching or breaking. Durability--will last for hopefully centuries without degradation, especially when protected by a covering of plaster, and is not adversely affected by moisture or normal temperatures. Permeability--some ability to breathe is particularly important when the fill material is dampened before being tamped into place; otherwise it will never dry out and become hard. Low cost--not too expensive for common use. Availability--readily available in a form that can be used. I suggest that you check with the manufacturer of the material in question and see how it compares to polypropylene, which rates very high in each of the categories. Q: Are burlap sandbags the same as earthbags? A: You can use burlap bags to build with, but they will eventually biodegrade, so the polypropylene is generally better. Q: Looking at bags, I see gusseted and non-gusseted available. I'm assuming the standard for construction with earth bags is the non-gusseted. Is this correct? A: I've used both the gusseted and the non-gusseted bags, and actually prefer the gusseted ones because the base of the bag doesn't produce pointed protrusions that need to be hammered back into the wall to make it smoother before applying a plaster. Q: I would imagine that using Polypropylene would not be very 'green' because it is a 'plastic'; how can your building be properly 'breathable'? A: The poly bags are certainly a plastic, so in that regard they are not very "natural". Burlap bags are more natural. However, I feel that their use is justified by their superior strength and rot-resistance over time. They actually do breathe quite well because the material is woven from strands of fiber that allow air flow. Q: I would like to build a home with stabilized earthbags and was wondering if you had any experience using natural materials such as burlap or jute instead of polypropylene bags/tubes. A: I don't have any personal experience using bags other than polypropylene, but I know of others who have used jute or burlap bags. These bags are actually more resistant to UV deterioration but less so to moisture than the poly bags. This shouldn't matter, however, if you are planning to stabilize the fill material. The natural bags can be more expensive as well. Q: I read that some people use pillow cases as their earthbags. Would this be a good idea or cheaper? A: I would not advise using pillow cases for bags because they will not last as long and they will be more expensive in the long run. Q: What is the ideal width of an earthbag wall or the recommended dimensions of the bags for this application? A: The earthbags that I have used are designated as 50 pound rice bags, and are about 17 inches wide when flat and 32 inches long. This size works well, but is not critical; the bags could be somewhat larger or smaller, but I wouldn't go much smaller or the stability of the wall might be questionable. Larger bags would be more stable, but take more material to fill them. Q: I am looking for dimensions of a filled sand bag. I know there are different size bags and you can put more or less material in them. However there should be a basic dimension I could use when trying to design some with a standard 15 x 27" sand bag. When filled what would it be l x w x d.
A: For a standard 18" X 30" bag after it is filled and tamped, the length is about 20" - 24", width is about 15" - 16" (with plaster), height is about 5" - 6". Your smaller bags might be more like 18 - 21 inches long, 12 - 13 inches wide after plaster, and 4 - 5 inches high. These would be too small for many building projects. Q: Is there a rule of thumb in determining the right size, e.g. if the dome is 3 meters in diameter, then a 40cm wide bag (30 cm with earth filling), and if 4 meters in diameter, then a 50 cm wide bag (40 cm with earth filling), etc would be appropriate? Also, terra-form.org that sells superadobe construction supplies has a calculator online for determining the right size bag. Do you agree with their recommendations. A: (Owen) Standard earthbag bags and tubes are 18" wide. Final wall thickness after tamping is 15" before plastering. That's all you need to know for 99% of most buildings. I recommend the 24" wide bags for walls that have to hold back a lot of pressure such as earth bermed walls. A: (Kelly) That is a pretty nifty calculator that they have devised. I think that it errors on the conservative side, but that is generally good. Q: Could you please tell me which kind of polypropylene bags are more suitable for soil cement: a) the ones that are kind of porous (such as those for rice or corn) or b) the ones that are kind of impervious (such as those for flour or sugar)? A: I would vote for the more porous ones, because they will allow any damp material to dry our better. Q: I live in Arizona; where is a good place to purchase polypropylene earthbags for building? A: I've been getting them as misprinted 50# rice bags, in bales of 1,000 from Inpack, at 800-622-3695. They can UPS them. Q: If we use a concrete/sand mixture can we use paper feed bags instead of the poly? It seems that the poly bags with that type of mixture are just to hold the form until it dries- is this assumption correct? If I am right about this then wouldn't it be the same idea using unlined paper feed bags? These are much cheaper, about $160 per thousand, and have a wet load tolerance of 50 lbs. A: You are right that with filling the bags with either dampened adobe soil or a concrete/sand mixture, the bags only hold the material in place until it sets up. However, I would have a couple of concerns about using paper bags for this purpose. Will they hold up well enough when damp? A 50 lbs tolerance may not be sufficient for the perhaps 100 lbs of material they would be filled with. The polypropylene bags that I used were misprinted rice bags, which cost me about $190/thousand and they are extremely strong and durable if kept out of the sunlight. Q: What will happen to the structure when the bags rot after some time? I am afraid that when the bags are worn out or rot then the remaining earth structure will no longer have strength to hold on together and will be vulnerable to damage due to rain, wind, excessive sun (long period of drought). A: The answer to your question depends on what material the bags are made of, and what they are filled with. If the bags are filled with a moist adobe soil, or stabilized soil, then it doesn't really matter if the bags rot, because the structure will remain solid. If the bags are filled with a looser material, then you should use polypropylene bags rather that burlap or jute, because it will not rot over time. You do need to be careful to keep the sunlight off the bags as much as possible and plaster them with something to protect them from the UV in the sun. (Owen) - one report said 30-year-old polypropylene bags were recovered from a landfill (which is approx. how long poly bags have been in existence) and they were still in good condition. - another report said the lifespan could be closer to 500 years: see www.gcswall.com: "An FHWA study sometime later concluded that the half life of polypropylene fabrics in these benign environments could be 500 years or more, which exceeds the service life of about any construction material used in our transportation facilities." Q: I have purchased bags to begin a small home for my son and me. The bags are 14x21 and 16x31. 1000 of each. I am now worried the smaller bags will be of little use. Is it possible to use these for earthbag building, possibly alternating rows? A: The larger bags are better for insulation and stability. The use of small bags that form 12" walls are really too small for most projects other than low garden walls and such. Nearly all of the significant earthbag projects that I am aware of use larger 50-100 lb. bags that measure closer to 15" X 24" X 5" when compacted. I wouldn't advise staggering the rows, as it is better to have a solid base for all of the courses. You might consider using the smaller bags near the top of your walls, or for interior partitions or something, if necessary. Q: Does it matter that burlap/hessian bags rot if you intend to cover exposed surfaces in cob or lime plaster and that the bags will be filled with mostly clay sub soil when building an earth bag structure? A: In this case, it probably doesn't matter, as long as the earthen material is kept absolutely dry so that potential deformation of the wall is not an issue. Q: I am curious if you know if the long sandbag tubing that CalEarth uses is more structurally sound than the large rice bags. Are there any benefits to one over the other? Disadvantages? A: The long tube bags that CalEarth typically uses have both advantages and disadvantages. Their use does reduce the number of seams between individual bags, and for this reason might contribute to greater stability of a wall. To my mind, this is about the only advantage. I find them much more cumbersome to actually fill and place on a wall, and they practically demand that at least two people are involved in the process. A major problem that I encountered was that they tend to roll as a unit when filled with loose material, like the crushed volcanic rock that I used in my bags. This is not so much of a problem when they are filled with adobe soil like CalEarth uses. Individual bags have a seam at the bottom, which gives each bag a distinct orientation that tends to keep it from rolling this way. C: We used polypropylene sandbags when I was in the Army. My experience from those days was that the poly bags installed in a wall and then bermed with earth (so that there was no UV exposure) would deteriorate fairly quickly if the soil in contact with them was consistently damp. "The main concern for PP geotextiles is to prevent thermo- and photo-degradation by using proper stabilizers." "Polymer degradation can also result from mechanodegradation, which is caused by the application of stress such as high shear deformation. The stress-induced degradation may result from comminution (grinding, milling, or crushing), stretching, fatigue, tear abrasion, or wear. Nonetheless polypropylene has good chemical and hydrolytic resistance." Q: Mark is also a distributor of Cal-Earth bags, which I believe have some kind of patent. I am tempted to trust him that they are superior to regular bags, and without knowing exactly why, I will most likely use them in my earth dome building in Hawaii. But I'm not quite sure, I will use them in El Salvador for my sister's project. It might be too expensive to ship the rolls in a container. A: I actually don't think the Cal-Earth bags are any different than other bag material...they have just been printed with the Cal-Earth words. Polypropylene is polypropylene, even if some of it has been coated with UV retardant. Nader did not patent this...he just realized that you could use the long tubing material for building instead of individual bags, which are also made from the long tubing. You can buy these rolls from the manufacturer for less than you can from Cal-Earth. I prefer to use the misprinted individual bags, which are cheaper yet. C: After watching your DVD, this is my own conclusion of why Cal Earth bags are superior. It's not that Cal Earth bags have a superior manufacturing process than everyone else. It's just that Cal Earth is not really selling bags, they are instead selling you the rolls from which you make your own bags. I could see myself trying to hold together hundreds of small bags. It would not be easy, and if I am not that careful, I would have several bags sliding over on a daily basis. At Mark's earthbag dome in the Big Island, we had close to zero bags sliding over. Most of the time we were filling out long tubes, which is another name for a custom size big bag. Sometimes the whole row was one big tube, and as we went up the tubes got smaller. Part of my job was to use scissors to cut from the roll, and then using a needle and wire I closed one end of the bag, and then I was ready to start filling it with earth. And the big help in making sure the tubes did not slide over was use of barbed wire. When the tubes are still wet, it is guaranteed that they are going to slide inwards if you don't use barbed wire. We found that out because of drying times which took close to a day, we could not do more than 4 rows per day. We used small custom made bags on very few occasions, as fillers in difficult angles, and of course at the very top of the dome. So, I think that anyone else can get the same results if they buy rolls of material to make the bags yourself, instead of buying hundreds of small bags all the same size at pennies each. Yeah, I don't see why anyone else besides Cal Earth cannot sell rolls of bag material. R: From my experience, I would say that with individual bags or long tubes, one is not superior to the other...they are just different and have different attributes. I used the small bags, partly because I worked mostly alone and it was way easier to do this with the smaller bags. I think you need more of a team (at least 2 people) to effectively use the tubing. I could fill the small bags with the light-weight volcanic rock that I used to fill them, carry these to wherever I was working and place them easily. I never had any problems with bags slipping off. I kept them laid horizontal and used the barbed wire, so they didn't really want to slide. I did have a problem with the tubing when I tried to use it once, because the loose material I used as fill did allow the whole tube to actually roll off the wall. Without the sewn hem at the bottom of each bag, there was a tendency for the tube to roll. But then for what you and Mark were doing, I can see how the long tubes were better...so it all depends. Q: The sandbags I am using are empty polypropylene sandbags ( 14x26"), 1600 uv treated. They have been exposed to the sun from 6am to noon from 2 to 17 days. They are covered for the rest of the day. Today the tarp blew off and they were exposed to the hot desert sun. My question is how much exposure will they tolerate before being damaged beyond repair? A: I used standard, untreated poly bags, and noticed that a detectable deterioration happened after maybe a month of full exposure to the sun. I don't know what the rating is for the treated products. My rule of thumb was to only leave those bags exposed that needed to be for the construction process, and then covered them up immediately. I also started a first coat of plaster over some of the finished portions as I progressed with the construction, but then I was working on a rather large project. Q: What size width tube role I should use. A: Usually what I have seen people using is about 18-20" wide, when flat, and would be about 15" wide when filled. Q: For a wall are individual bags better or should we use long runs of tubes? A: They both work just fine. Tubes might be slightly more stable or integrated, but with barbed wire the individual bags work well. Q: Is it possible to find the continuous superadobe fabric tubing or is it better to use individual sandbags? A: Both the tubes and the individual bags work fine, although there are some differences: tubes take more people to fill and lay them and often cost a bit more; bags are easier to find, fill, and may cost less. There are sources list for both here. Q: The Hunter/Kiffmeyer book suggests a 17x30 bag as standard, that anything smaller will not do. But that's for a team (or at least two people) to fill in place; I, on the other hand, will be working alone, so I can't really be throwing coffee cans of dirt to myself. I assume I'll be filling bags ahead of time, like the pictures of the Sun House on your website. Unfortunately H&K's book says the 17x30 bags tamp out at 90-100 pounds, which would be a little heavy for me to lift into place after filling, so I've been leaning more toward the standard sandbag size of 14x26. What do you think, is that really too small? Maybe I could do two courses for a thicker wall? A: (Owen Geiger) I agree with Doni and Kaki. At least 17"x30" bags are needed for wall stability. 14" wide bags would be about 12" wide once filled and tamped, and very prone to tipping over. You could do a double wall, but that's not very practical. You're talking about a huge amount of extra work. So keep looking until you get the right sized bags. Also, I suggest getting a helper, even a high school kid or someone who wants to make a few extra bucks. Earthbag building is very labor intensive, and certain steps like building upper walls almost requires another worker. Or you could fill the bags with scoria (lava rock). Anyone could handle bags of scoria by themselves. I'm pushing hard for scoria-filled earthbag construction. Q: How would I locate used bags? A: (Owen) Try hard to locate new but used bags. Surely you must have pig farmers, chicken farms, etc. somewhere within driving distance. These places go through huge quantities of poly bags and should be eager to make at least something by reselling them. What do they do with their used bags? Someone is probably buying them up and reselling them -- maybe feed stores. Q: I am carefully reading the instructions and wondering if earthbags are as sturdy as plastic tubing when it comes to the roof for a dome? Is there any difference? A: Well the earthbags have worked well for me. When they get tamped together with the barbed wire they become a rather solid block anyway. The long tubes might be slightly more stable, but I am not sure of this. They are also more cumbersome to fill. Q: If a house is built of sand filled plastic bags, will the moisture trapped in the bags cause mold? A: Actually, the polypropylene bags are a woven fabric that breaths to some extent, so the contents can eventually dry out. Mold usually requires some organic material to subsist, so purely mineral earth doesn't necessarily provide that. Q: An ad on Craigslist we have posted looking for donated bags has gained us in upwards of 2000 or more bags ready for pick up over the next week. Should these work? A: (Owen) Check the bags carefully. They may be fine, but you need to check for good quality, strength, uniform size, etc. Maybe tamp a few trial bags using bags from each source and see how they withstand the tamping process. And be sure to store them out of sunlight. Q: We'd be using old poly bags, or maybe the long tube-bags from CalEarth -- the CalEarth bags are what I've worked with before, but jeez they're pricey! We're in an agricultural community, so old feed bags are abundant. A: If you can access used bags in reasonable condition, I would say go ahead and use them. I actually find it easier to work with individual bags...and it is certainly cheaper. Q: How thick is the typical wall? Does this differ for outer and inner walls? A: A typical earthbag wall is about 15 inches thick, although this varies with the size of the bag and the thickness of the plaster. Inner walls can be made in a variety of ways, with wood framing, etc., so this varies also. Q: I have a question about diddling bags. Do you think it is absolutely necessary? I have found a gusseted polypropylene bag 15x5x31 that seems to work just fine. The bags are a bit more expensive but it may be worth the time savings from diddling. A: I like gusseted bags, as they do keep the bottom end from pointing out. But even with the ordinary bags, the requirement to "diddle" the bags is much overstated and too time consuming I think. I simply took a hammer to the pointy corners and knocked them back into the bag before plastering, and that worked fine. Q: I notice on the cal-earth website they use continuous woven bag tubing which can be cut into any length of bag required, as well as listing this 'tubing' as available in various diameters It seems a good idea, but does it have any real advantages over using ordinary same-size bags for everything? A: Both the long tubular bags and individual bags work well for most earthbag construction, especially if the barbed wire is used between courses. There might be some slight mechanical or aesthetic advantage to the tubing, but this might be offset by the need to have a crew available to handle the need for continuous feeding and placing of the fill material; one person alone can build with individual bags. Also, the tubing seems to be more expensive, especially if you are able to source used or misprinted bags. The tubes do eliminate any problems occurring with bag bottom corners poking out and needing to be punched back in. Q: The use of a bag full of whatever to start off a home makes no sense at all; the bag will disintegrate. A: The polypropylene bags are actually quite stable if kept out of the sun...and in many cases they only serve as an initial form to contain earthen material that then "sets up" sufficiently that the bag is no longer necessary. Q: How long will earthbags hold up in sunlight? A: (Owen Geiger) It's difficult to know for sure how long earthbags will hold up in sunlight. Some brands fall apart pretty fast, as soon as a few weeks. Equatorial and high elevation areas may experience slightly more rapid deterioration due to increased UV levels. From what I have heard and read most bags hold up okay for about 2-3 months. The safest way is to buy tarps or black poly and keep them covered as much as possible. However, tarps are prone to blowing around in the wind and can be a bit of a nuisance. If you're doing a large job, then you can either buy UV resistant bags, which cost more, or in the case of vertical walls do one wall section at a time (including adjacent corners) and apply at least one coat of plaster as soon as possible. (Kelly): One good indicator of how long the polypropylene material will last if exposed to the sun are the tarps themselves, which are often the same material. My experience is that they just get progressively weaker as time goes by, and may show signs of deteriorization after about two months' exposure and usually by about 8 to 10 months it is pretty easy to punch holes in them with a finger. And these tarps are often supposedly UV resistant. Obviously the best thing is to not take chances and keep the bags covered at all times, except when working on them. Q: Do plastic earthbag bags off-gas fumes like VOCs, etc.? A: (Owen) I don't really know. There's no discernible smell, and I've never read or heard anyone warn of this. A quick search on Google didn't turn up anything. It's best to avoid all synthetic materials as much as possible, although in this case most people seem to agree the benefits of earthbags far outweigh any negatives. And keep in mind, the bags make up just a tiny percentage of the over all structure. And even then, they're buried behind thick plaster. 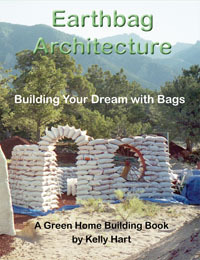 C: Superadobe bags, like most sandbags (earthbags), are made of Polypropylene. If you google for Polypropylene MSDS (material safety data sheet) you'll see that the only concerns for safety come from burning polypropylene in unventilated spaces (and coming in contact with hot, melted , burning plastic). It is a very safe material; its used for everything from water bottles, pill bottles, candy containers, yogurt containers, plates/forks/spoons, blankets, shirts . thermal underwear. 100% Polypropylene is not recommended for clothing/bedding if there realistic risk of explosions (refineries, war-zones). Ok, back to http://en.wikipedia.org/wiki/Polypropylene#Degradation Polypropylene, when exposed to UV breaks down into http://en.wikipedia.org/wiki/Aldehydes http://en.wikipedia.org/wiki/Carboxylic_acids So if you were to build your earthbag house in a hermetically sealed sun room (airtight), and if you were to leave your polypropylene walls exposed to sunlight to the point that they fall apart (say 1-3months for non-UV-resistant polypropylene). And all the polypropylene has all dissolved, and then you walked in there and tried to breathe in all the vapors, there is no chance it would do you any permanent harm. Ok, you might be disturbed by the smell and fall and hit your head, or you might get an asthma attack, but if you leave the door open for 5 minutes you'll be fine. In conclusion, practically everything will outgas, but you're safe if you open door/window daily (like when leaving/entering). Polypropylene is very safe. Q: I am hunting for places to get bags and I want to know if there is a thickness gauge that the polypropylene bags need to be. The website polybagsupplies.com has options of 1 mil through 6 mil. The thinner the cheaper. A: Most of the bags that they sell are polyethylene, and these are not generally suitable for earthbag building. They do sell some polypropylene bags of 1.5 mil, but I am not sure that these would be suitabale either, since they provide a moisture and vapor barrier. Mainly, woven polypropylene bags are used for building because they will breathe and allow the moisture in the soil or other fill material to evaporate. Q: I am planning on building a storage shed out of sandbags. I am hoping to make my own sandbags but I can not decide what to use to make them. Any ideas? A: The standard sand bags, or earthbags, are made out of polypropylene, and this is a good material because it is so strong and resists degradation if damp (although it must be kept out of the sun for long periods). You can actually buy the long poly tubing that standard bags are made out of, but there is no savings in doing this over just buying the pre-sewn bags. I have heard of people taking old sheets to make earthbags, but this may not be as durable over time. Q: Where have people in Mexico been buying the bags? In the states or in country? A: I just returned to the states after living in Mexico (near Guadalajara) for the last five years, and did some earthbag building down there. The bags, called "costales" are really pretty easy to find in Mexico since they are used extensively for agricultural products. They are also often used to store construction debris for later disposal. In Guadalajara, and likely in other major cities, there are "costalerias," or special stores that sell them, or you can find them both used and new in many hardware stores "ferreterias". The most common size is really larger than necessary for building, however, so it might take some searching to find the smaller size bags (they measure about 17" X 32" when flat). Also, there must some large bag manufacturing or printing companies down there where you might be able to find cheaper misprinted bags, but didn't find one. Q: I am in the process of deciding which method to use to build our house (strawbale, earthbag, etc.) and am really interested in earthbag construction. We currently live in Argentina and would be building the house here. I was wandering if larger bags could be used. Sand is delivered here in large polypropylene bags (1 meter x 1 meter). Is it possible to use these larger bags for the walls, instead of the smaller ones? I know the walls would obviously be thicker, etc. but was curious as to whether you foresee any problems in using these bags. A: (Owen) The best choice will depend on your climate and what materials are most affordable and practical. Straw bales work best in dry climates, and are faster to build with. Earthbag is best for other situations, especially hurricane and earthquake regions. The large bags you're describing would waste too much space. Every square meter needs roofing, etc. And they would be very difficult to build with. How would you make small adjustments to line them up? Standard 18"x30" bags are the most practical size. You'll get stable walls with no wasted effort. Q: I have been collecting 20kg grain bags from friends, neighbors, poultry breeders and stables. I am amazed at the range in sizes for 20 kg bags. Some 25 kg bags were thrown in as well. While all the bags are within the width recommended for walls I was wondering how to approach the varying widths when filling. Should I sew the larger bags on the sewing machine to the required width or make rows of large bags and tamp the sides to match? My build is a basic round house with a diameter of 3.5 meters. A: I suggest that you first sort the bags according to width, and then start using the largest bags at the base of the round house, and then graduate upward with smaller bags, using the smallest at the top. This will give you a relatively smooth wall with a slight taper that people will probably not even notice. Q: I read of a potential problem with "UV Sunrays" causing breakdown in the bags, or certain bags. What would be your choice of the best ones to buy? A: You are correct that the UV in sunlight will degrade the polypropylene material that most earthbags are made of. Some of these bags have been treated for UV resistance, but this only extends their life in the sun for a few months at best. All earthbag buildings need to be protected as soon as possible with plaster, and it is a good idea to protect the walls being constructed temporarily with tarps until they can be plastered. The most common size bag to use is often designated as a 50 # cereal bag (about 18" X 30" when laid flat). Q: How does Earth Bag do in regards to out gassing and VOCs when it is first built? There seems to be a definite correlation between Sick Building Syndrome and the increase we see in depression today. A: As far as I know there is no off gassing with the polypropylene bag material itself. Any likely off gassing would occur from whatever fill material was put into the bags, and this generally natural mineral materials, such as sand, clay, volcanic stone, etc. ...pretty inert stuff. And then the bags need to be covered with a thick plaster to protect them from sunlight, so there is another level of protection there. Q: I've seen earthbag done with individual bags and a continuous line of bagging material that you cut yourself. The continuous bag seems like it would waste a lot of the bag area with ties on each end so I'd like to know which is best (and more cost effective). A: Usually with the tubing rather long lengths are cut and then filled in place on the wall and laid down like a coiled ceramic pot, so this is actually rather economical of material. Surprisingly though, often the tubing costs more per foot than the sewn bags. Q: Are the bags 'solid walled', that is are they non-perforated or perforated? Perforated would allow liquid H2O in the dirt/Earth fill to escape over lengthy time making the soil(s) rock hard. A: Standard polypropylene bags are woven from strands of poly material, so they are porous to that extent, and will allow transpiration. You generally want the damp soil mix that has been tamped to dry out and form solid blocks to make firmer walls. Q: Some reference materials state to avoid non-skid coatings on woven polypropylene bags for earth bag building claiming the bags don't breathe well. How critical is it to have bags with no coatings? A: It is fairly important for the bags to breathe so that any moisture in the packed material can evaporate and "cure" the contents, making a nice firm bag. Often the fill material is moistened and tamped to form hard blocks. Q: Has anyone looked into building with bulk bags or FIBC? May be faster and easier to fill using a bobcat plus at 36 inches thick could have great thermal mass depending on fill. A: (Owen Geiger) FIBCs require huge amounts of fill material and create walls that are much thicker than most people want. They're not practical for housing in most cases in my opinion. Q: Hopefully you can give me some advice on levelling a section of my garden. It is flat at the top then slopes off fairly steeply. I want to create a larger flat grassed area and need to build up the level from the sloping section. Can this be done using a hessian sandbag filled with soil and will turf root itself through the hessian to stabilise the retaining sandbag wall? A: Earthbags make great retaining walls, but hessian or burlap bags will rot away fairly quickly. Roots will certainly penetrate the bags, but this may not be enough to stabilize the wall. For a more permanent installation I suggest using polypropylene bags that will not rot, although you will need to protect the bags with a plaster or some other covering to keep the UV in sunlight from causing deterioration. C: I’ve decided to use old malt bags from my brewery which we have in abundant supply, and after reading your website I think these are going to work very well. Thought I’d just mention this to you as most local small breweries are likely to have plenty of spare bags that you could get for free (they’re often difficult to recycle!). The bags have a woven plastic outer and waterproof plastic inner. For my wall I am removing the inner liner so that the bag breathes and should (hopefully!) release any hydraulic pressure by allowing water to flow through it, and also allow us to cut a small slot to grow plants in the wall to assist with longer term stabilization. R: I see no reason why this approach shouldn't work. It sounds like you are building a retaining wall. Q: Would an earthbag that was 2' by 4' by 2.5' be as strong as the common size? I realize that, in addition to the fill, some kind of reinforcement would have to be included (something comparable to rebar used in concrete). A: It is hard for me to imagine what the advantages might be of using such mega bags. You would be using considerably more fill material than is really necessary for most building projects. And the stress on the skin of the bag to contain all of that weighty material would also be considerable. Trying to compress or tamp such large blocks would be difficult and place even more stresses on the bags. Q: What are the typical dimensions of an earth bag that is 22" by 35" after it has been filled? A: The most common size of bag for earthbag walls measures about 18" X30" when flat, and makes a block about 14"X24" when filled, folded and tamped. A 22" by 35" bag would probably become more like 18" X 30". This size might be good for basements or first floors in multi-story buildings.